I played a game this week, called Universal Paperclips. On the surface, it’s a simple clicker game. But through the course of playing it, I kept thinking about engagement. What had me coming back to make more paperclips? What about this game was so irresistible? There are an awful lot of articles and studies out there that talk about increasing engagement, and one of the strategies to do so is adding more visuals. Visual design is one of the main vehicles for communication. Some say, without visuals, experiences fall flat. But Universal Paperclips isn’t much to look at. It provides constant feedback. 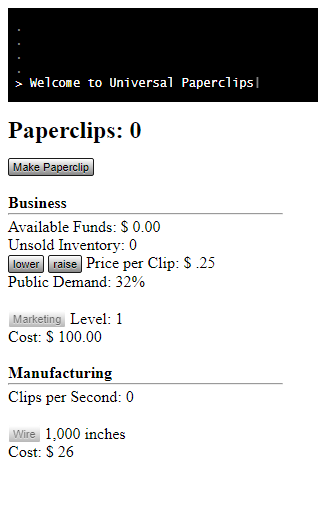 You always know how many paperclips you have, and if you click “Make Paperclip”, ta-da! Another paperclip. That instant feedback is incredibly engaging and kept me coming back to adjust, optimize, and buy in order to make that number go up faster and faster. There’s no rush. While you are timed (a little notice appears in the black bar with your time when you complete each phase of the game) there’s no countdown clock, no push to sort things out more quickly other than your own sense of urgency. If you walk away, you can come back later and make sure everything is running along smoothly, and then progress to the next inputs required from you. There’s no artificial pacing. There’s no mandatory tutorials or obastacles designed to slow you down- you can (and do) pick up the pace as you go. It keeps you guessing. Each time something new appears in the game, it presents more questions than it answers. As with a well-written short story, your creative mind will fill in the blanks, identify patterns, and develop a story that’s far better than anything more prescriptive. You have a clear goal. Throughout, you’re always making more and more clips. There’s various steps you have to take to achieve this (including spending clips!) but that number is always there at the top of the screen, incrementing ever upward. These same techniques can be used in your learning experiences- keep those goals front and center and build in opportunities for frequent feedback!